Ticket is for the ALL OUT 10.00 - 10.99 1/4 ET Muscle Class - Saturday main event racer entry. Friday Test & Tune can be purchased at gate. Racers get an exclusive online deal on our ALL OUT Live racer T-shirt. These style T-shirts are only available to racers during checkout and not for sale at the track. Check out our contingency products as well, buy these products and if you win an event you get paid! All products purchased on our ticketing site can be picked up at our merchandise booth during the event (sorry no shipping). Please have all your racer registration tickets and product receipts printed and ready to show at the event. Go to www.alloutlive.com for more event info! Ticket is for the ALL OUT 8.00 - 9.99 1/4 ET Extreme Class 5- Saturday main event racer entry. Friday Test & Tune can be purchased at gate. Racers get an exclusive online deal on our ALL OUT Live racer T-shirt. These style T-shirts are only available to racers during checkout and not for sale at the track. Check out our contingency products as well, buy these products and if you win an event you get paid! All products purchased on our ticketing site can be picked up at our merchandise booth during the event (sorry no shipping). Please have all your racer registration tickets and product receipts printed and ready to show at the event. Not Pinks All Out® or Pass Time® of the past. Something much Bigger & Better! ALL OUT Live. Two TV shows....One Live Event, everyone in attendance gets a chance to win Big Cash & Prizes! 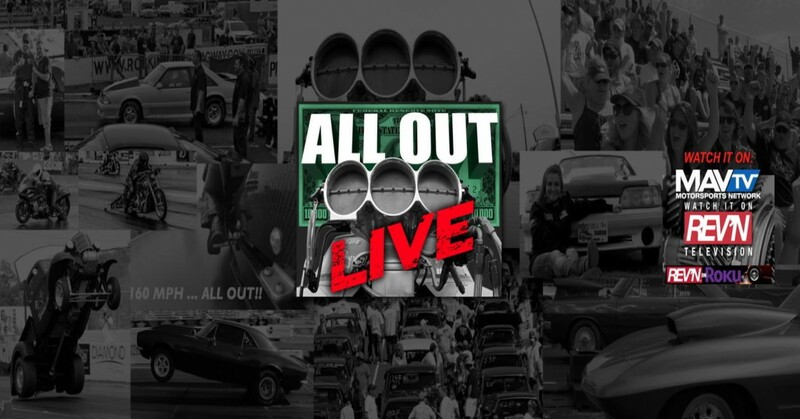 Show 1- ALL OUT Racing: With three heads up ALL OUT style ET race classes (Street, Muscle & Extreme) there's more chances for racers to compete and Win Big Cash & Prizes. While the racers battle it our fans from the stands and viewers online can play along with Instant Green host "Gavin Jerome". Choose Left or Right Lane, its that easy. Choose the correct lane and you can win Cold Hard Cash! Show 2- The CALL OUT: From Keyboard to Concrete, Top Outlaw Grudge racers from all over the country take on local area racers who think they can beat them.. It's a CALL OUT! Got a beef with another racer or shop? Settle it on our show, check out the CALL OUT section of this site for details!